A common signature of the host cell responses to infection with pathogens is that many of these genes are known to be regulated by the NF-jB signaling pathway. The Rel/NF-jB family is comprised of several structurally related proteins that form homodimers and heterodimers. The most common Rel/NF-jB dimer contains p50-p65. These dimers bind to a set of related 10-bp DNA sites, called jB sites, to regulate the expression of genes. NF-jB-regulated gene products play a critical role in orchestrating both innate and adaptive immune responses. More than 150 different stimuli are known to induce activation of NF-kB, and more than 150 target genes are known to be regulated by NF-jB [80, 81]. The most prevalent classes among genes regulated by NF-jB include cytokines such as IL-1a, IL-1b, IL-6, IL-10, TNF-a, lymphotoxin, G-CSF and GM-CSF, chemokines IL-8, MIP1a, MIPlb, MIP2a, and MIP3a, chemokine receptors such as CCR5 as well as other factors such as COX-2. Genes encoding NF-jB Rel proteins were also found to be stereotypically regulated upon infections, reflecting the autoregulation of this signaling pathway . During the past decade, important questions concerning the mechanisms of innate immunity, particularly the molecular basis of recognition of pathogens by the host, have been addressed. In fact, a number of pathogen-associated molecular patterns (PAMPs) and their recognition by so-called pattern recognition receptors (PRRs) of the host have been identified. Probably the most important system of PRRs is the Toll-like receptor (TLR) system . There are 10 TLRs which recognize a broad spectrum of bacterial, fungal, viral, and protozoic compounds such as, for example, lipoteichoic acids (recognized by TLR2), lipopolysaccharides (TLR4), CpG DNA (TLR9), dsRNA (TLR3), and flagellin (TLR5). Several alternative signaling pathways that are initiated by engagement of TLRs and the adaptor molecules involved in transmitting these signaling pathways have been identified. The signaling pathways via TLRs originate from the cytoplasmic TIR domain. There are at least four TIR-domain-containing adaptors (MyD88, TIRAP, TRIF, and TRAM) that play important roles in TLR signaling. MyD88 is essential to signaling pathways of all TLR family members that lead to the production of inflammatory cytokines. In addition, TLRs bind to other adaptor molecules such as TRIF (TLR3 and 4) and TRAM (TLR4), which leads to the activation of the transcription factor IRF-3 and subsequently to the expression of IFN-b and via activation of STAT1 to the induction of interferon-inducible genes. The TLR signaling pathway explains the common response pattern induced by bacteria in dendritic cells and macrophages as observed by transcriptomics. TLR2- and TLR4-mediated signaling leading to variations in a common host response. Moreover, cross-talk between different signal transduction cascades may lead to a different response than activation of only one signal transduction cascade. 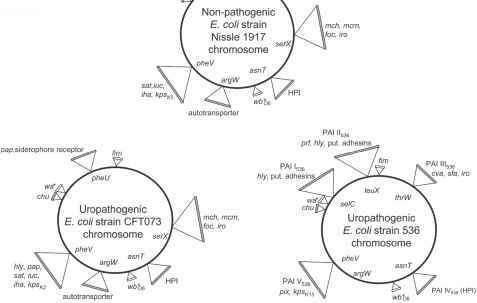 (c) Modulation ofthe host response by virulence factor composition. Distinct virulence factors and unique other components of the pathogen may act very specifically with distinct host receptors, or toxic effector mechanisms of a distinct virulence factor may inhibit signaling cascades activated by PRRs. (d) Modulation ofthe host response by genetic factors. Allelic variation in the host, including point mutations, insertions, and deletions in distinct genes or gene regions (e.g., in a receptor), may lead to modulation of the host response. out in infections such as HIFla-mediated and WNT signaling pathways might be involved. Taking all the data together, we can conclude that there are both a common canonical and a variable specific host gene expression response in bacterial infections (Fig. 21.2). This can be explained by the diverse nature of pathogens which, however, is recognized by the host via PAMP-PRR recognition, leading to a convergence of pathways which promote common responses. However, individual virulence factors of pathogens may cause profound changes of this common response. Moreover, as discussed in the next section, mutations in the host genome may also account for the diversity in gene expression upon bacterial infections.